Everything in the Universe likes to go in circles. Moons orbit planets, planets orbit stars, stars orbit other stars — and in each case all parts of the system are interrelated. The speed at which one star orbits another, for instance, depends intimately on the masses of both stars and the distance separating them. Simply, increasing mass and decreasing separation will both cause faster orbits. This is why planets like hot jupiters, which hug their parent stars, orbit at blistering speeds. The more massive the star, the more furious the orbit. The same is true of anything orbiting a black hole… Although as usual, a black hole has a habit of taking gravity and turning the volume up to 11. There’s a radius around black holes (and other extremely dense objects like neutron stars) where orbital speed is equal to the speed of light. Where this happens, you find a photon sphere, which is what’s depicted in this image. Photons leaving a light source near a black hole and passing near the black hole at just the right angle will be trapped into a circular orbit. As such, a black hole will be surrounded by a shell of photons. A photon sphere. This seems counterintuitive at first. 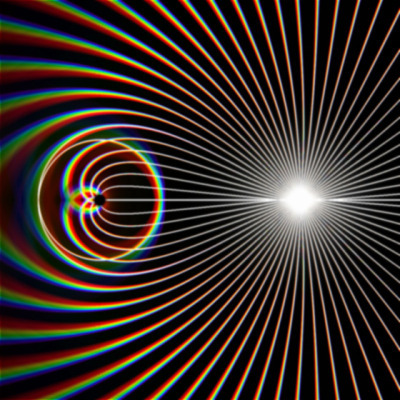 Gravity, after all, affects objects with mass, and photons have no mass at all. We know because special relativity tells us so. If a photon had any mass at all, it wouldn’t be able to travel at the speed of light. But photons do travel at the speed of light because, well, they are light. Actually, those photons don’t interract directly with gravity, rather they interract with the spacetime around the black hole. The black hole’s mass warps spacetime, causing paths of light to curve around it. In precisely the right region of space*, that path will become so curved that it will actually become circular and photons will orbit. As a result of all of this, a photon sphere isn’t your typical orbit. The photons can only orbit in a perfect circle — no elliptical orbits are possible (you could technically call it a non-keplerian orbit). The slightest deviation from this perfect circle and the photon will either escape back into space or fall into the black hole’s event horizon. Subsequently, the orbit is dynamically unstable. The tiniest perturbation, such as an infalling piece of matter will scatter the photons from the sphere. Incidentally, this doesn’t stop a photon inside the photon sphere from being able to escape the black hole’s gravity. Escape velocity doesn’t reach the speed of light until you get as close as the event horizon**. Light that falls inward past the photon sphere will inevitably spiral towards its doom, but any object inside the photon sphere can still emit light which can escape the black hole’s gravitational maw. Weirdly enough, that means that if you were to hypothetically fall into a black hole feet first, you’d see the strangest thing. If you were to look straight ahead the entire time, there would be a moment where, whichever direction you were facing, you’d see the back of your own head in the distance! *Around a non-rotating black hole, the photon sphere will always exist at 1.5 times the schwartzchild radius (RS). This is why a massive neutron star can also have a photon sphere, provided its surface is within 1.5 RS. **Actually, this is why it’s called an event horizon. Any events that occur inside simply cannot be observed from the outside — like objects on Earth which are ‘over the horizon’. This entry was posted in Imported from Livejournal and tagged astrophysics, black holes, celestial mechanics, neutron stars. Bookmark the permalink. Say, the image in this post — where did it come from? Is that really what the focusing effect of a black hole next to a supernova looks like? I’m sorry but I’m afraid I don’t recall where that image originated. Which is slightly embarrassing. But it gives a fairly accurate (if somewhat stylised) impression of how gravitational lensing would work around a black hole, yes. The light source doesn’t need to be a supernova for gravitational lensing to occur. Any light source, such as a star, would suffice.